Smiths Group plc is one of the world’s leading, multinational technology companies serving customers in five main markets: medical technology, security and defense, general industrial, oil and gas, and space and aerospace. Smiths is renowned for their expertise in medical devices and consumables, high precision scanners, heat and fluid management, electrical products, and seal technology. They push boundaries, drive progress, and deliver excellence by keeping systems working while operations run safely and efficiently. Smiths offers a comprehensive and attractive benefits package including health care, a 401K plan, dental, and vision benefits. 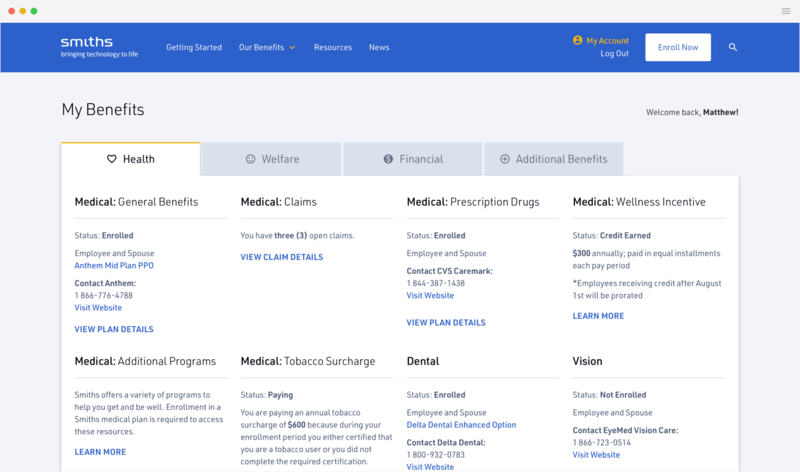 But details about these benefits lived across several different providers’ websites, which led to staff relying heavily on HR for more information. This created a cumbersome experience for all involved. 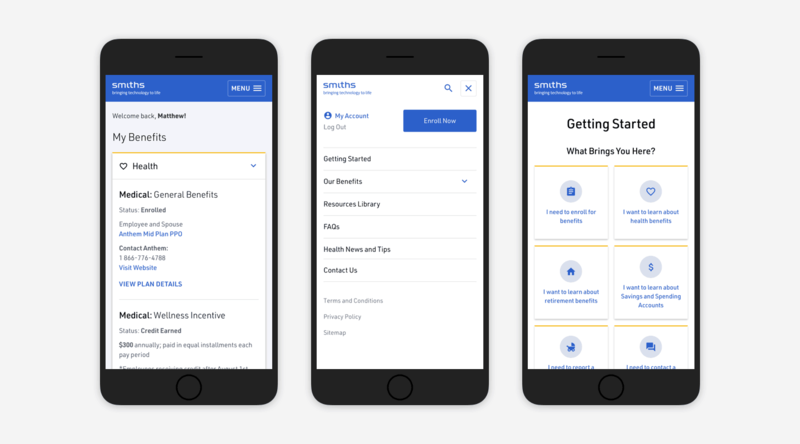 In order to save time and provide a better experience for employees, Smiths needed an innovative tool to improve employees’ awareness of their available benefits, increase participation, and improve process efficiency. eCity planned extensively with Smiths to provide the best possible user experience for Smiths’ employees. 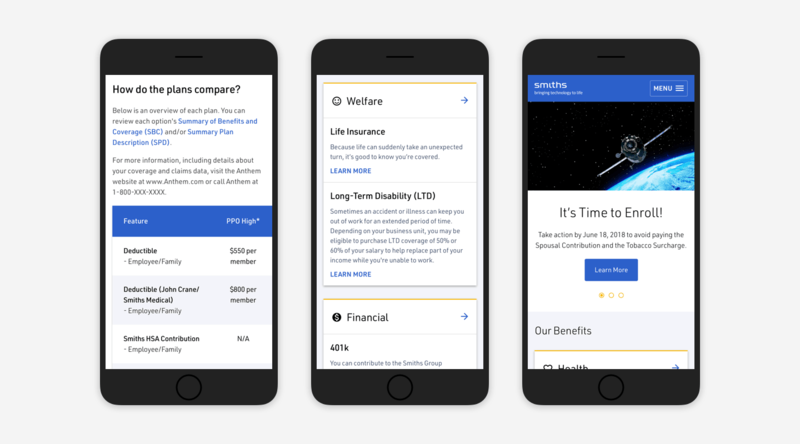 We worked with four benefits providers (Athem, Mercer, Towers Watson, and Fidelity) to create custom data feeds and APIs including employee’s benefit details. After securing each providers’ technological cooperation, we merged all the data into a single, easily managed, and secure CMS. Partnering with Smiths, we managed the design, development and integration from initial planning and wireframing to software development, and we continue to manage the PCI compliant server, where the integrated data is secured, on Smiths’ behalf. 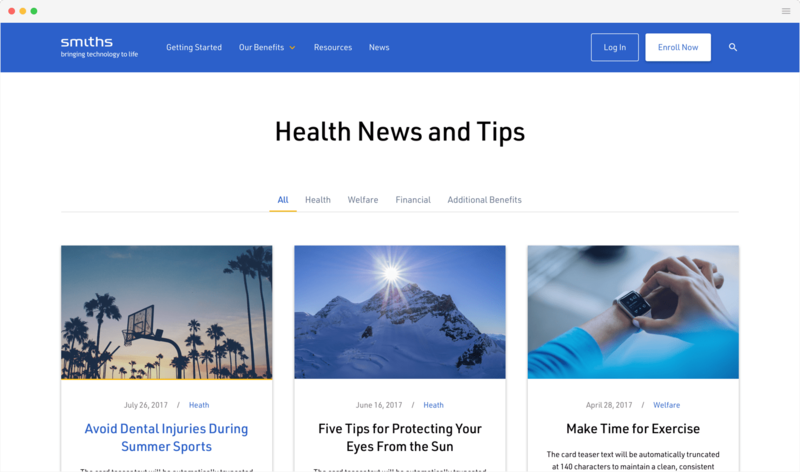 The new, responsive, and all-encompassing benefits dashboard provides authenticated Smiths employees with quick and easy access to all the information they need in one place. This dashboard uses a secure, single sign-on gateway to provide personalized information. 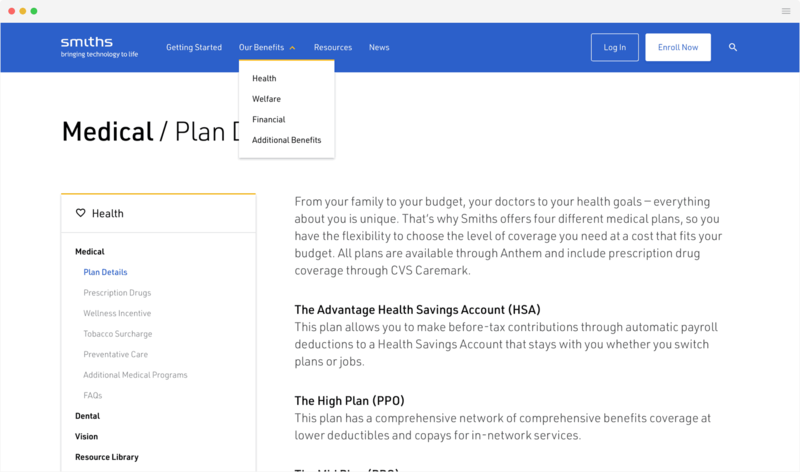 Once logged in, employees can click on any component of their package for a deeper dive into each specific part of their plan. This new dashboard better matches Smiths’ reputation by improving efficiency and delivering excellence to all employees.